​At Woofs ‘n Wags we provide a clean and safe environment built not only on an infinite love of dogs but also on a core understanding of dog behavior. Each of the members of Woofs team undergoes a supervised training protocol. As such, new members learn about behavior and canine body language. Studies include book theory, practical training and ongoing seminars. Our team members are all longer term as they are valued for their dedication to our visitors. We do not have volunteers in any capacity to ensure the quality and standard of our care and long term relationships with all of our visitors. A few of our team member introductions are below. Nikki Sherwin has a degree in psychology and a College certificate in Child and Youth Worker. She always had a keen interest in behavior. She started off being professionally employed in 1994 teaching behavioral programs to children. She developed and taught anger management, self-esteem and friendship groups and participated in one to one counseling. Her experience in child psychology transitioned to dog behavior and she never stopped. Since 1997 Nikki has worked professionally with dogs. Developed a bite prevention class and introduced a R.E.A.D (reading education assistance dog) program in elementary schools. Participated in the St. John ambulance dog therapy program. Developed Winnipeg's first and only scent room. Nikki has applied dog research to a new application in the positive approach to dog behaviour in a daycare setting. ​Seminar presenter in the field of dog behaviour. Her latest presentations have included: Canine Compulsive Disorder, spatial aggression, thunderstorm phobia, The hyperactive dog and canine communication, Collars and the unintentional damage we may be doing. Professional member of the Pet Professional Guild.The Pet Professional Guild is a membership organization representing pet industry professionals who are committed to results based, science based force-free training and pet care. No pain, No Force, No Fear. She shares her life with 4 Canine kids, which many of them came with “special needs”. All her dogs are rescues. Her big boy Duffy came to her with spatial issues and exhibited aggression to both people and dogs. Butterfly taught me that small dogs have big personalities. Paisley is a borde collie X terrier and was my first and only foster and foster fail. She has a hidden disability as she has no tongue. This limits some activities but her love is limitless! Each of my dogs over my lifetime has taught me everything I know and respect about dogs. Her dream became a reality when she opened Woofs ‘n Wags in 2007 , wherein she puts the dogs dreams first .Dog dreams include leading a daycare environment that is Collar free and Aversive free. She coined the phrase and leads Woofs 'n Wags as Winnipeg's only NAKED DAYCARE. Click to find out more (coming soon). For a list of great resources and my personal library click here. Jenn has been part of our team since 2008. She holds many titles at Woofs 'n Wags which include Canine Educator, Behaviourist and Daycare Manager. Law degree, teacher at Red River College and working in veterinarian offices. ​She defines her success in many ways but most importantly is finding happiness and balance in life with work, family and activities. In her personal life she has a family of four children, 4 dogs, rats, horses, miniature pony named Sawyer, birds and rabbits! Allex joined Woofs 'n Wags in 2007. ​ itters that she raised and bottle fed. Coupled with that experience is her natural ability to understand canine communication. In the past 9 years she has attended multiple weekend workshops in the field of behaviour. Her strength in the positive approach to daycare management resonates with all her coworkers. At Woofs her love of dogs is unending and the care she shows them is incredible. She is always coming up with new approaches in the positive approach to behaviour which includes games to play with them like hide and seek and find the ball. if she is needed she is here for our Woofers and Wagglers!!! ​Thanks Allex. Many of you see Allex after work to. Just go to the dog park or to a rescue party or gathering…you will probably find ALLEX!!! Shaye is our Social Media Manager of our Instagram Account and daycare professional. She has been surrounded her entire life by dogs and worked with many personalities and believes in building trustful relationship with each of her dogs and animals. She also has a horse named Sequoia and participates in English jumping. In her fourth year of kinesiology at the University of Winnipeg Victoria came to Woofs and found her gift and direction for her future. She has had a love for animals since she was a child starting with little critters like frogs and fish, to discovering her love for dogs. 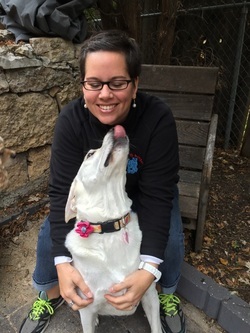 Her love for animals became much more realistic when she joined the Woofs family in 2011, where she found others with the same love and passion for dogs. In her personal life she shares it with four canine friends that keep her active in dog activities. You can find Victoria hiking, camping and sledding with her furry family members and specifically sledding with the Snow rider team. 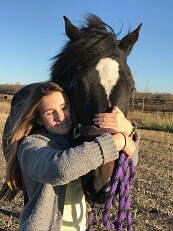 Her commitment to being a certified groomer, attending grooming conferences and ongoing studies as her goal is to become a teacher and a judge in competitive grooming. Most importantly is she developed a skill for handling dogs and understanding behavior and body language before she became a groomer. This relationship with dogs spearheads her dogs grooming experience to be one that encapsulates patience and creating each dogs experience to be as positive and calm. This is why we are proud that she has gone after her new career and she is part of our family. She is the perfect fit because she is both understands and cares! Courtney joined the Woofs team in 2012. Her passion for dogs started as a child as she began taking care of her neighbours dogs. She dog and cat sat throughout her teens and young adulthood which started her keen interest in dog behaviour. She remembered how hard it was on dogs when family went on vacations and was forward thinking on what she could do to help the dogs through approach, games, caring and love. 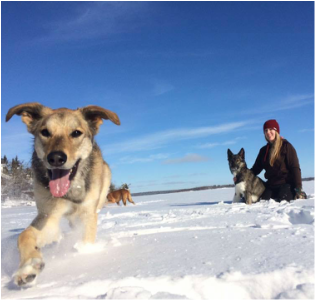 Since 2012 Courtney has delved into dog behavior and dog sports.She is actively involved in dog agility and dog sledding. Her keen interest in understanding how a dog thinks and communicates furthered her dog interest and in 2013 when she began her new career in grooming. She certified not long after her training began and has now become one of our fully certified groomers. She actively seeks out continuing education both in grooming and in behavior. She has attended multiple seminars and conferences. A few of the multitude of seminar (apart from grooming) topics have included body language, canine attention deficit disorder and TTouch. In her personal life she participates in all things dog! Jenn has always been passionate about dogs. She has shared her home with all types from the tiniest to the gentle giants. She has owned almost every species of pets from Guinea pigs, bunny rabbits, horses...and the list goes on. Jenn holds a law degree and has worked in the school system assisting children with personal challenges. In her personal life she has 4 children, 4 dogs, rats and birds. Currently her latest project is target and clicker training her birds and agility training her rats.With her dogs her interest has led her to participate in pet therapy and veterinary assisting programs, recreational obedience, agility and rally obedience. Jenn has worked at Woofs since 2008 as an Obedience Instructor. She attends ongoing seminars and conferences in the field of dog behavior. Some of her favorite conferences have included Brenda Aloff and attending inaugural year of the Pet Professional Guild (PPG). She is also a seminar presenter for the Canine Community Connects in the professional community. Past employment have included Humane Societies, a pet supply store, dog grooming and as a pet nutrition consultant. All her past experience both personal and professional led her to specialize in dog behaviour. Ask her why her path has led her to focus in on Dog behavior. Nikki has been teaching K9 Education classes since 1998. Collars: Are we causing unintentional harm? In her personal life she has 3 rescues and a human daughter who also shares an infinite love of animals.